I just go cheese-crazy at holidays, and often put together rather elaborate cheese trays for family dinners. Sometimes I get the camera out to document the tray, as I did here a few years ago – but not until we’d already made inroads! The cheeses here were a blue (Maytag?) and Wensleydale with cranberries in front, with a slice of mousse pâté on the left. Then Parmigiano Reggiano on the right in the middle, then in back, a little bowl of a fruity condiment (likely mostarda which I love), to the left, in front of ash-covered goat cheese and on the rear right, brie (I think) with caramel marcona almond topping. I also picked up blackberries and small currants (and are those large black grapes on the left? ), then laid it all out on those paper leaves you find at places like Williams-Sonoma. The crackers etc. were in a basket to the side. 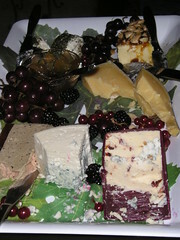 Last year I ordered, with great success, a selection of cheeses from igourmet. They arrived right on time two days before Thanksgiving, in pristine condition, so I can highly recommend that if you want to avoid the shopping crowds.